After the interval the singers came on with tinsel as hair or buttonhole accessories and this led us to expect a lighter, jollier second half of the evening. However, de Rore’s Hodie Christus natus est was sung carefully. The vocal fatigue that we had heard towards the end of the first half was more evident. I wanted a warmer sound for the Victoria Magnificat but in this and the Franco Salve Regina this warmth was provided only by the tenors. The other Salve Regina billed was by Claudin de Sermisy, but Peter Phillips announced that the piece would not stand up to performance so was replaced by a setting of the same text by Josquin. The final piece was Taverner’s motet, possibly written with Christopher Tye, which may explain the two contrasting styles in the piece: a stratospheric soprano line interspersed with an earth-bound harmony. Though immaculately executed, I did feel it needed an effort to have us imagine we were in a cathedral acoustic. 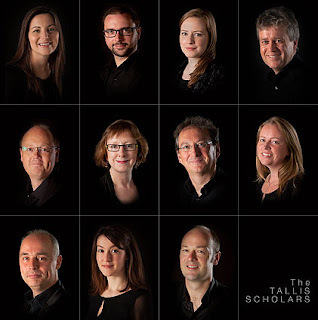 The encore was chosen by countertenor Patrick Craig, one of the two singers who were singing for the last time with the Tallis Scholars (the other being tenor Chris Watson). He chose a piece for Epiphany by Lassus – by far the brightest sound we had heard all night and, as such, made more sense of the programme (and the aforementioned tinsel). The capacity audience were unreserved in their appreciation of the concert, with rock-gig whoops at the end.